Siok Hostel offers Free Coffee/ Tea, Free Wi-Fi, Free Breakfast, Spacious Dorms with Windows / Super Single Bunk Beds with Spring Mattresses, Air-Conditioning in every room, Personal Socket, Personal light,Super Clean Facilities, Rain-Head Showers, Cotton Linen, Towels and Blankets, Quality Toiletries ( shampoo, shower gel) interactive Common Areas and the Friendliest Staff. Can you find a better deal? We believe it’s impossible! Located on the corner of Lebuh Chulia and Lebuh Leith, it is right in the middle of Penang’s backpacker area, and occupies three beautifully renovated shophouses. The love and care that has gone into restoring this previously burnt-out heritage building is evident in the high-end finishes and preservation of original features, including antique tile floors and louvred windows, which are offset by bold, contemporary elements and a running colour theme of shocking orange accents. The owners are also art lovers, and you will find diverse wall frescoes and other creative touches and flourishes around every corner. From Airport Take RapidPenang bus no. 401 to Carnavon Street. Walk to Lebuh Chulia. Then take bus no. 101,104, 201,202,203 at the junction of Carnavon St./Lebuh Chulia bus stop (oppo. 7-Eleven). Then get down at bus stop in front of Hotel Blue Diamond & Café (Lebuh Chulia 1-stop). Walk along Lebuh Chulia toward Jalan Penang. We are beside the SUBWAY. From Butterworth Bus Terminal Take ferry to Penang island Jetty Bus Terminal. From Penang island Jetty Bus Terminal Take Rapid Penang bus no. 101,104, 201,202,203, 204,206 to Lebuh Chulia bus stop (in front of Hotel Blue Diamond & Cafe). Walk along Lebuh Chulia toward Jalan Penang. We are beside the SUBWAY. From Sungai Nibong Bus Terminal Take Rapid Penang bus no. 401, 301, 303 to Lebuh Chulia bus stop opposite of Hotel Blue Diamond & Café (Lebuh Chulia 1-stop). Walk along Lebuh Chulia toward Jalan Penang. We are beside the SUBWAY. From KOMTAR Bus Terminal Take Rapid Penang bus no. 101, 104, 201, 202, 203, 204, 206 to Lebuh Chulia bus stop opposite of Hotel Blue Diamond & Café (Lebuh Chulia 1-stop). Walk along Lebuh Chulia toward Jalan Penang. We are beside the SUBWAY. In the event of cancellation we require 72 hours notice prior to the arrival date. If this condition is not met, the reservation is subject to a cancellation fee equivalent to the cost of the first night’s stay. The charge will also apply to no show bookings. PLEASE REMEMBER THAT SIOK HOSTEL IS A NON-SMOKING AREA. 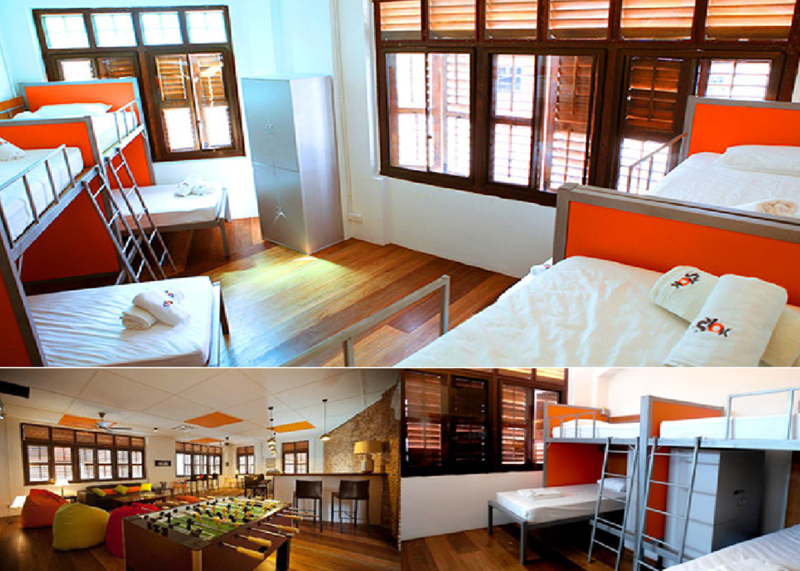 THE AREA COVERS; WALKWAY, STAIR WAY, SHOWER & TOILET, LOUNGE, DOUBLE ROOM AND DORMS. FEEL FREE TO USE THE OPEN TERRACE ON SECOND FLOOR! GUESTS ARE ALSO REMINDED THAT VISITORS ARE REQUIRED TO REMAIN AT THE RECEPTION AREA AND ARE NOT ALLOWED TO ACCESS ANY OF THE HOSTEL FACILITIES UNLESS THE INTEND TO STAY AS GUEST AND SUBMIT THE REQUIRED DOCUMENTS AND PAYMENTS LISTED ABOVE. MALE GUESTS ARE REMINDED THAT THE FEMALE ONLY DOMITORIES ARE STRICTLY OUT OF BOUND. ANY MALE GUEST FOUND ENTERING, LEAVING OR LOITERING AROUND THE FEMALE ONLY ACCOMMODATION WILL BE IMMEDIATELY BE ASKED TO LEAVE AND THEIR BOOKING WILL BE CANCELLED WITHOUT REFUND. THIS IS TO SAFEGUARD OUR FEMALE GUESTS WHO WISH TO ENJOY THE SECURITY AND PRIVACY OF THE FEMALE ONLY AREA. THE STAFF AND MANAGEMENT OF SIOK HOSTEL WILL IMMEDIATELY NOTIFY THE LOCAL POLICE SHOULD ANY GUESTS OR VISITOR BECOME ABUSIVE AND /OR AGGRESSIVE TOWARDS ANY MEMBER OF THE STAFF OR GUESTS. LOCAL POLICE OFFICIAL WILL ALSO BE NOTIFIED OF ANY SUSPICIOUS ACTIVITIES OR INDIVIDUAL ON, OR IN THE VICINITY OF THE HOSTEL.